Do not skimp on the ghee as it is the flavor of clarified butter that gives the dish its distinct flavor. 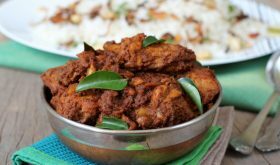 One of the best Mangalore recipes that I have tried. I served the Chicken ghee roast with Ghee rice and sambar. Made for a delectable mid day meal. If you do not have the small variety of dry red chilies, use 10 large dry red chilies. Those who can take the heat of the red chilies, can increase it to 14-15. 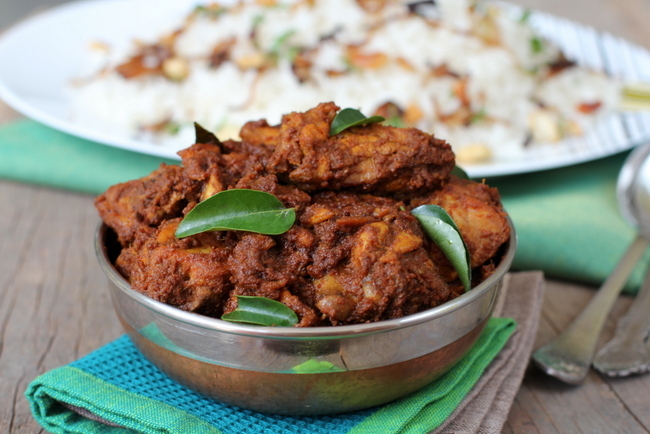 By Sailu Published: December 27, 2012 There are quite a few chicken dishes among Mangalore recipes. 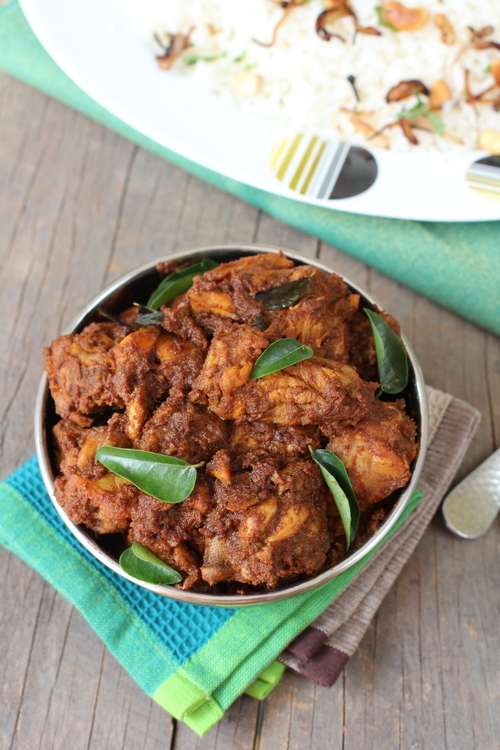 But a culinary gem among them all is the Chicken Ghee Roast. Goes well with ghee rice. idi awesome…nenu idi weekend try chesthunna…ma parents unnaru naatho ippudu…U rock!! Aah!! The much awaited Mangalorean speciality atlast. Will try it out and post response. excellent recipe!!!! never had one like dis…. it woz finger lickn good…my hubby really enjoyed it…. so did my little puggy…. Hi, please don’t mind but Kundapura is not close to Mangalore. It takes around 3-3.5 hours (if you’re lucky) to reach Kundapura from Mangalore. I’ve graduated from Manipal University so I can say this with confidence. Maybe you can mention it’s close to Udupi. It’s the closest large town to Kundapura. Kundapura is 2-2.5 hours from Mangalore and people in Kundapura are happy to be associated with Mangalore. I grew up here and when I talk people from North India or abroad, I say Kundapura is close to Mangalore. Thank you very much for the excellent comment. People from surrounding areas do associate themselves with Mangalore especially when talking to outsiders. It looks like the gentleman above looks very uncomfortable with such an association. What could be alternative of tamarind?? Tried this beautiful recipe on the weekend and what a hit it was!! Thank you very very much! Awesome recipe. Simple to prepare. This was my only 2nd chicken preparation..just loved the taste. Thank you! I have tried your recipe last night. It was very tasty. Thanks. Hello……MangloreUdudpi & Kasargodu Is Same ..Kundapur Totaly Diffrent,,,its tooo far to travel,…….Manglore Udupi & kasargodu Language also Same ………But Kundapur Langage not able to understand ….even north karnataka languag can understand but not kundapur.. Your recipe is awsome…trying with mutton today.